Intuitive touch screen interface to take orders. Eliminate staff training with the user-friendly design. Run your business more effectively by speeding up your counter & tableside service. Paperless orders for the win! Keep your customers coming back with shorter lines and faster checkouts. Have them tip & sign on your device. No need for extensive staff training with the remarkably simple and easy-to-use touch screen interface. Quickly select menu items by category or search by name. Top selling items are listed under Frequent Items. Categorize by order type, enter guest information, save and edit at a later time. Print tickets to one or multiple printers. Eliminate miscommunication between your staff. Quick Service Restaurants can automatically send tickets to the kitchen directly after payment. Easily add a special one-time item to orders. Select a pre-defined price or enter any amount. Optionally, add a custom name. 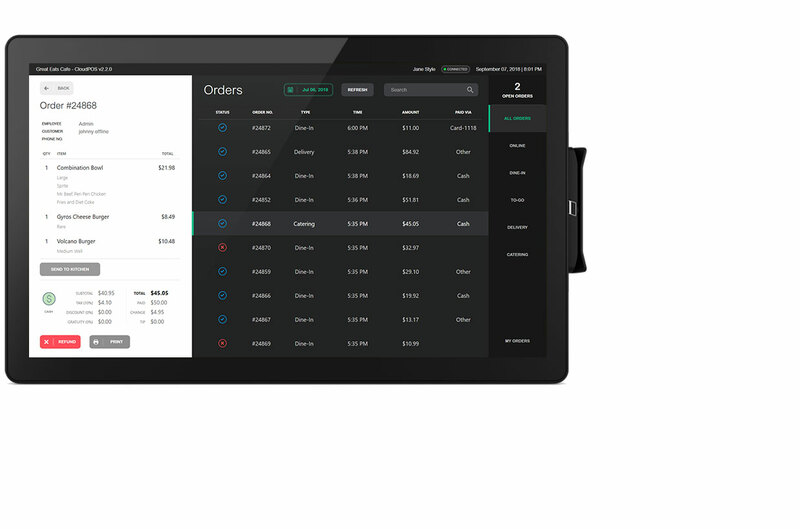 Manage all your orders in one place. Whether you want to view yesterday’s orders or see how many To-Go orders were made, Order Management makes it all convenient. View order status, order number, payment type, time. Additionally, orders can be filtered by date, searched by order number, cancelled or refunded. Full service restaurants can also add tips to orders. Edit pending orders to add or delete items. Resend selected items or the entire order to the kitchen. Customer wants to book in advance? No problem. Assign a future fulfillment date to orders. Even take a partial payment too. Handle transactions easily by accepting payments via cash or credit card using an integrated card reader or an external terminal. AmeriCloud Payments merchant account comes integrated with our solution. Enjoy an average low processing rate of 1.99% + $0.30 or lower per transaction. Need to split the bill between customers? No problem, we do the math for you! Bills can be split evenly or by different amounts and payed with any combination of cash and card. Have your customer tip & sign directly on the device or on receipts. Party of 5 or more? Quickly add gratuity with a tap of a button. Get a Daily Summary at the end of each business day, view Top Selling Items, and print Sales Reports. See Total Sales for the day according to cash, credit, refunds, as well as tips or added gratuity. Total Number of Orders and Items Sold allow you to quickly estimate how busy your restaurant was for the day. Gauge the health of your business by viewing key trends over different months and use the data to develop strategies to increase sales. Quickly identify what's hot on your menu and use the information to spot food trends and create menu options that cater to your customers' taste buds. Online orders opens doors to a new generation of customers that prefer convenience. Add an additional revenue stream by allowing customers to place orders from your website, Facebook page & mobile app. When you accept an order on your online ordering tablet, you can view and/or pay for it on CloudPOS or have your customers pre-pay online. 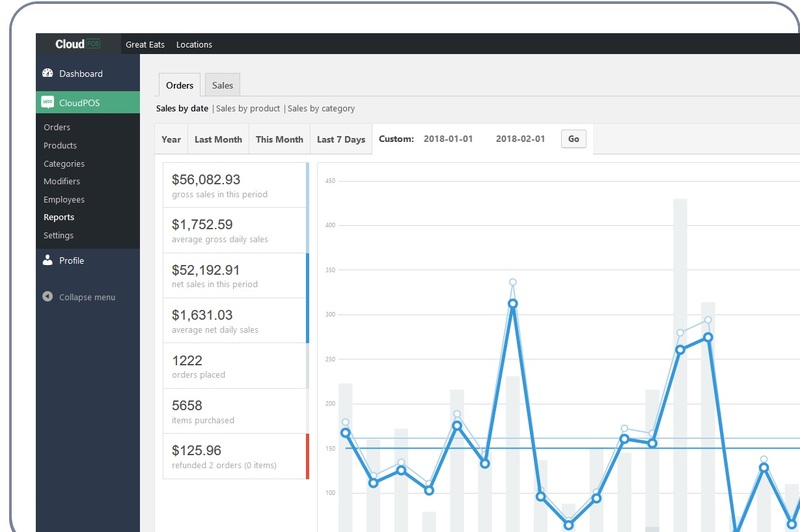 View total number of online orders and amount collected in your daily sales report. No need to juggle between multiple reporting systems. 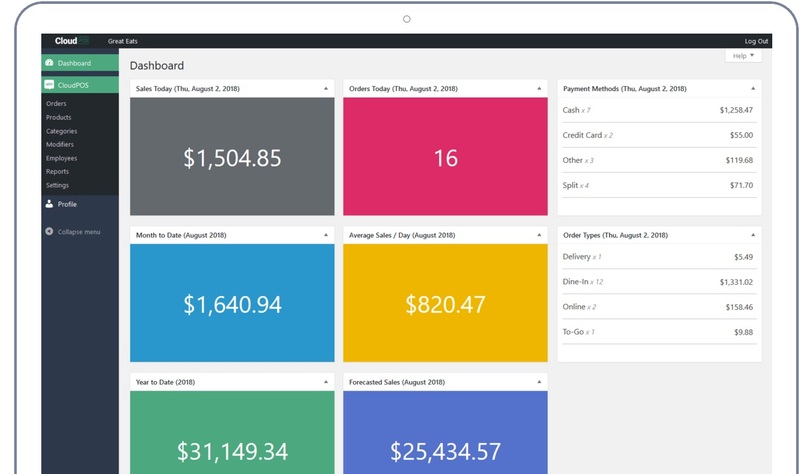 Online Ordering Integration is an add-on feature that complements CloudPOS. Click here to learn more. You may also call our sales team at (847) 380-4186 for more details. All your data is backed up to the Cloud for easy and secure access from anywhere. Know what’s going on in your restaurant in real-time. Customize your menu and adjust prices from the restaurant – or from home – and it’s available on all your devices with the touch of a button. Customize orders based on your guests request. Make it spicy, set a cooking preference or add an extra patty! You can easily add modifiers and add-ons directly in our app. Waiters can quickly Log In with their unique Passcodes with permissions set by the restaurant manager. Each order is linked to a waiter and the waiter’s name will appear on receipts. 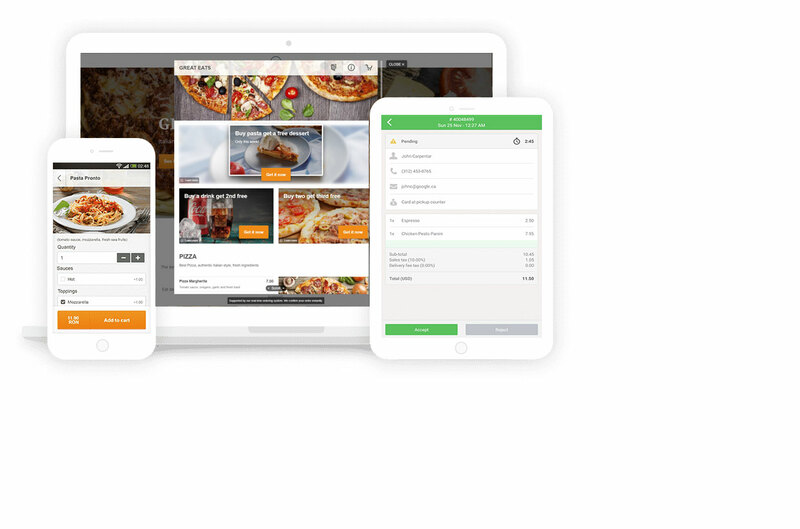 We are planning to scale up our backend systems in order to accommodate medium to large franchises so they can leverage the CloudPOS platform and manage several restaurants. Have a poor Internet connection or no connection at all? No problem. You can continue to use the system and take orders normally. 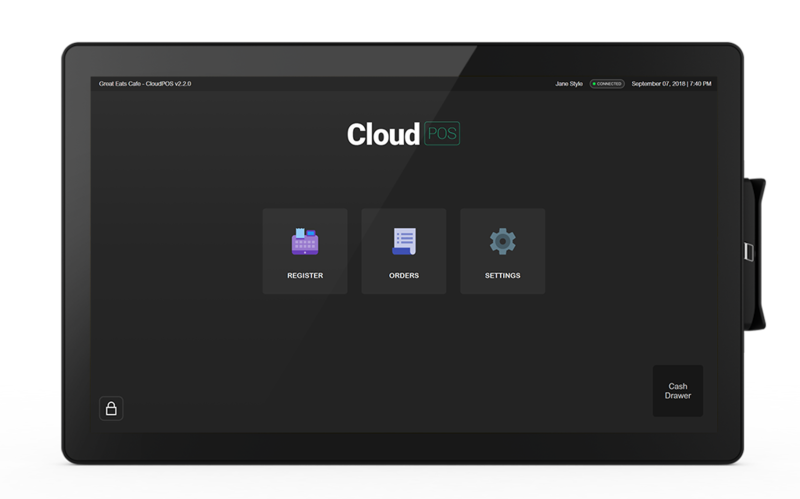 CloudPOS will queue up orders and sync when connection is restored. You can assign table numbers to orders and get an overview of all tables in your restaurant at a glance, auto capture when the customers arrived and were seated. We are working on launching an iPhone / Android app for restaurant managers who use CloudPOS as their point-of-sale system to monitor their restaurant’s sales and reports on the go in real-time. No cancellation fees, annual fees or any other hidden fees. 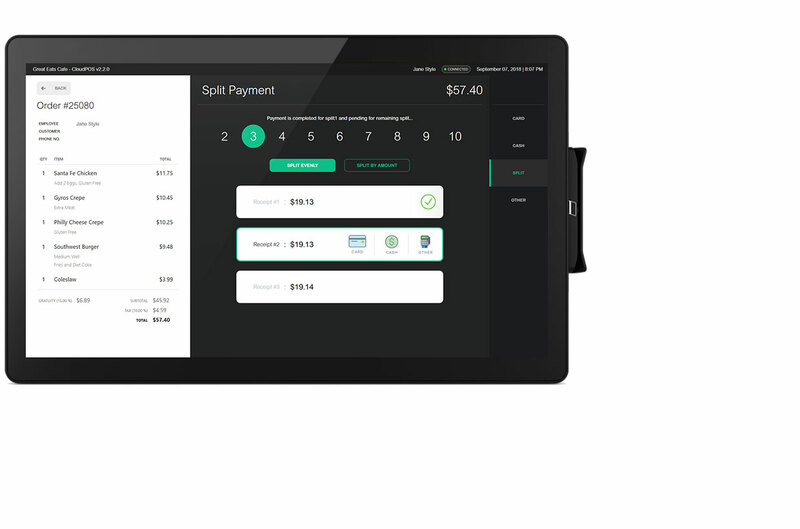 Additional POS licenses costs $15/mo each for multi-device setups. No up-front costs to sign up and software upgrades are included for free. With AmeriCloud Payments merchant account, you can process credit card transactions at a low average rate of 1.99% + $0.30 per transaction whether you swipe, insert chip or manually key-in. 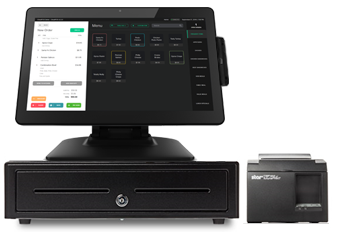 Point-of-sale hardware for every sale. Note: Hardware may be purchased either in one-time payment or 12 months interest-free installments (qualified customers only). Hardware provided by us are backed by respective manufacturer’s warranty. Interested in learning more? We can’t wait to hear from you! Copyright © 2019 CloudPOS for Restaurants. All Rights Reserved.